Part of having a successful user group is having great content to present at meetings. Some groups are able to get guest speakers, products demonstrations, and even remote presentations. But for some groups that is not always logistically possible. It is fortunate for user groups that Apple has made resources available that could benefit user groups. From Apple podcasts, to Today at Apple, to Apple Sales Web there are resources to create great meeting presentations. The Apple Sales Web (ASW) is a resource Apple offers to user group ambassadors. ASW offers resources on recently announced products including Apple hardware and software. Keynote and PDF materials are available to download and assist groups in using in their meetings. The listed ambassador for each user group is granted access to this system. Many times in the monthly user group bulletin, we will spotlight new resources on ASW that would benefit groups. If you want further information regarding this take a look at our webpage for Managing an Apple User Group. If you are a user group ambassador and would like to access ASW, you can open a support ticket to request a link to the application page. Podcasts have been around for some time. What was once geared toward audio, soon shifted to video podcast as well. A little-known feature on iTunes is that Apple provides a wide variety of podcast on different topics. For groups not near an Apple Store, there are some great store events that Apple podcast called: Events at the Apple Store. Categories of events include filmmakers, musicians, and authors. Another great category of podcast from Apple is listed under the technology section: iPad in Business. This series of podcast covers iOS Quick Tips, iPad Stories, iPad at Work, and many other areas. Along with iPad, Apple also has iPhone in Business as well. Looking for one of Apple’s Keynote events? Those are also on the iTunes Store podcast section as well. There are also many great podcast under the Apple Education Podcast section as well, covering Tips for Teachers and Teaching with iPad. Though some of these podcast are geared towards specific markets, they still offer great resources for user groups to use as video presentations at their meetings. Below you will find direct links to the iTunes store sections of Apple podcast discussed. On April 25, 2017 Apple announced new education sessions in their stores called “Today at Apple.” This program is being rolled out in May into their stores, and will be a great opportunity for user groups and members to take advantage of some great offerings by Apple. Some user groups only meet monthly, so this is a great resource for both leaders and members of groups. 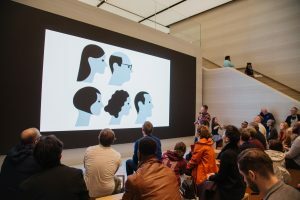 A member of a user group might attend an event at an Apple Store, and in turn be able to bring back and share what they learned at the session. There may also be topics or presentation at an Apple Store that can be shared with membership who would be interested in attending an event. These may be topics that may not be covered at your group meetings. You can find out more about “Today at Apple” from their press release. So, whenever you are stumped for a great meeting topic, Apple offers resources that can help you provide a presentation that is informative, timely and interesting. From ASW to Apple podcasts to Today at Apple, there is a topic that meets your needs. Check them out today!